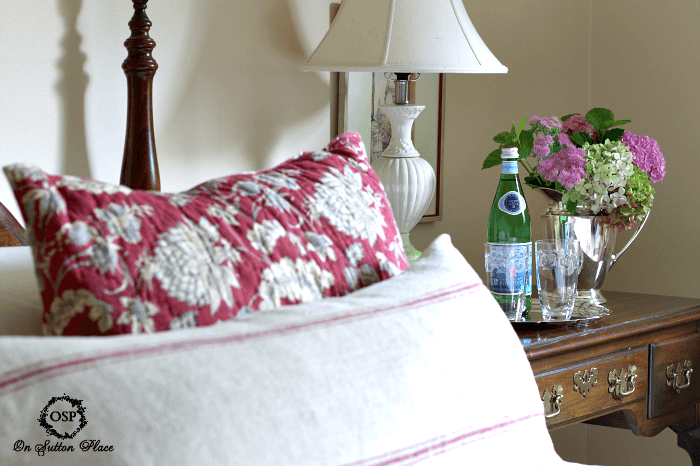 Welcome to our Master Bedroom…the room that I’ve kept hidden since the beginning of my blog! I finally had to spend some time refreshing things because of an inquiry from a photography firm. I haven’t heard a thing back from them and my hopes are not high. The one good thing that came out of it though is that I spruced up the room a bit. It was neglected and really needed an update. I didn’t take before pictures because the changes aren’t massive. Just imagine this room a little less put together and very sad! I didn’t have time to paint and probably wouldn’t have tackled that anyway. So I worked with what I had. The room is dark so lightening things up was my main goal. Instead of the duvet covering the bed, I added a quilted coverlet and put the duvet cover at the end. I used ivory accessories where ever I could. The lamp and plates were borrowed from my living room. I took my vintage prints to Hobby Lobby and switched the mats from dark tan to very light ivory. 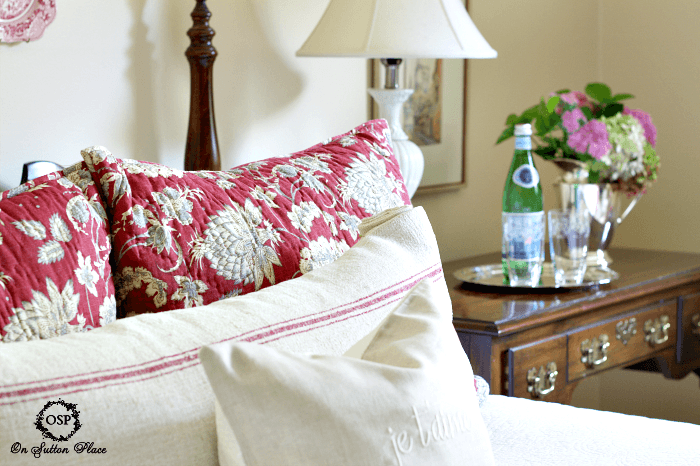 I tucked the red patterned shams behind a grain sack pillow and a linen accent pillow. Below is the view from the end of the bed. There is just enough space to walk between the bed and the wall. No room for a lovely bench…much to my disappointment! I shopped my house for more wall decor and found the red transferware plates in my china cabinet. I had completely forgotten about them so I was happy to bring them out of hiding. If you are wondering about the rest of the room…here it is. My husband and I bought the cherry furniture right after we were married. I would imagine it’s considered vintage now…or very close! Here’s a shot of the window…all the windows on our second floor are the same size. Small. I made the valance from Pottery Barn Red Ticking and a shower curtain I bought to match the bedding. The wall opposite the bed is just closet doors. I refrained from photographing it…I figured you weren’t interested in a wall of louvers. In a few hours I managed to make our very tired and neglected master bedroom blog-worthy. Anyone can do this. You don’t have to have a grand, gigantic space to make it cozy and fresh. Shop your house for accessories. Just moving something from one room to another can make it look totally different. I still have a few rooms that you haven’t seen…not sure you ever will but I’ve learned to never say never. I never thought I’d show our master bedroom and here I am. I would list the sources but I’m doubtful anything is still available. The red bedding is from Pottery Barn and the quilt is from JCPenney. 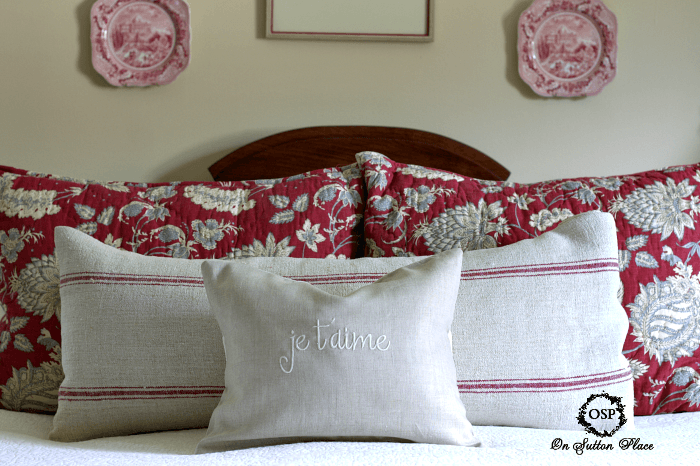 The je t’aime pillow cover is available in my Etsy shop. Everything else is vintage or a family heirloom. 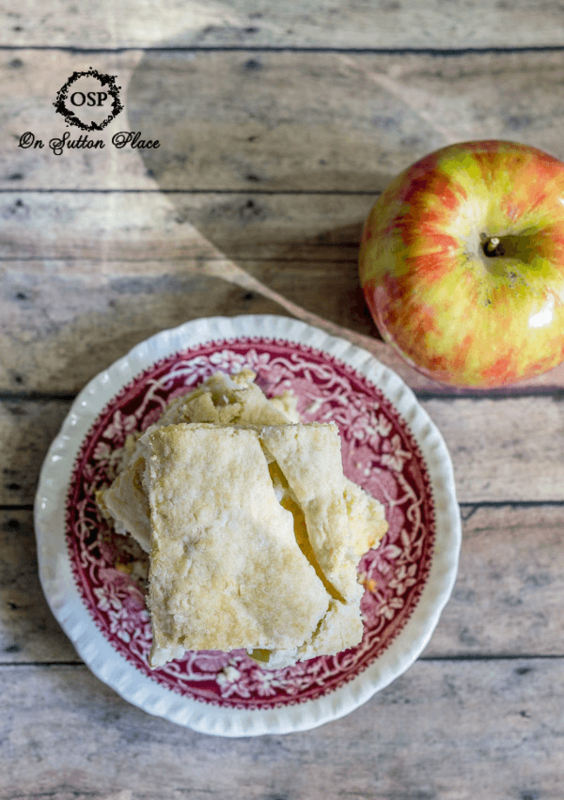 Here’s a little “taste” of my next apple recipe. It’s Apple Slab Pie and I used one of the red transferware plates I found for the photos. I’ll be back over the weekend with the recipe. Your bedroom is lovely. We are about to update our room, and I wondered what color you used on your walls? Thank you! Ann, your bedroom is gorgeous. I love the lumbar pillow in the grainsack! Ann, I have to tease you a bit about your lovely master bedroom. Your living area might be Notre Dame’s colors, but your master bedroom is all Alabama! Roll Tide! I love the pretty crimson and white, all kidding aside. Your bedroom is gorgeous, and I love the grain sack and linen pillows! Beautiful master Ann, I love your bedding! I too have shared very little in my master, it is way, way, down on the fix up list! Your bedroom is beautiful. Since no one ask , I know you have grain sack in your shop .but where did you get the long grain sack pillow ? Ann, what a beautiful room! Unlike a lot of folks, I never ever take anyone who ‘tours’ our home into our bedroom. lol … now now, it is a perfectly nice room! Just I am a very private person in some ways. Couldn’t post photos like you have. But thank you for another glimpse into your beautifully decorated home. FInally, a peek into your bedroom! 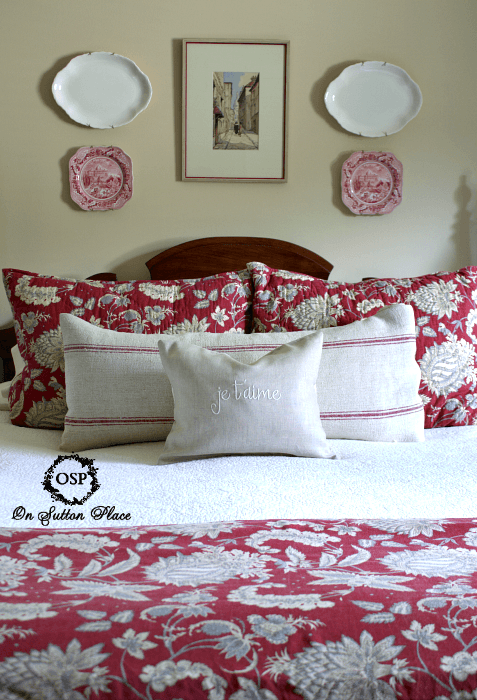 It’s gorgeous … love all of the splashes of red and the beautiful plates on your wall! I’m sure you’ll hear back from the photographer very soon! It is beautiful and you used some very clever ideas. Do you sew or do you use the sticky tape that other bloggers have mentioned? Ann……it’s just lovely. I had almost the exact replica of your side “lowboy” table. I gave it to my daughter, because it goes with her bedroom furniture which is the same style as yours. You certainly did a great job of pulling it all together..
Ann, your bedroom is pretty. The bedding and those red dishes caught my eye right away. 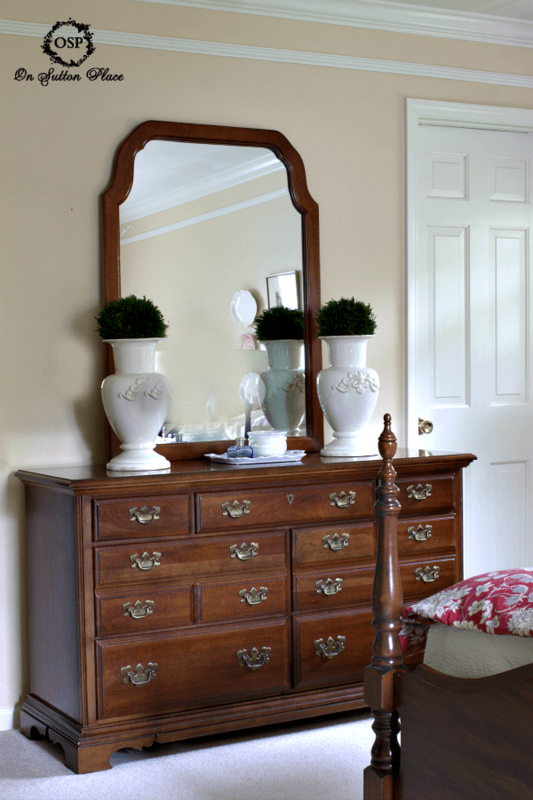 The pillows you made are very pretty too and I adore the urns on your dresser. Ann, your bedroom is beautiful. I love the splashes of color you’ve added. Well now, it seems like you’ve done all you can do in your house so when can I expect you to come help me with mine – lol… I have a big house that needs a special touch like yours :) Have a great weekend. I’ll be back for the recipe! Pretty, Ann. You know I love red. Your bedroom is very pretty and your blog is wonderful. Thanks for sharing. I just found your website yesterday as I was looking for a recipe for apple walnut bread. It really intrigued me, so I explored the other content. Oh, my goodness, I felt like I was coming home! It is everything comforting and it brought beauty to my soul. It reminds me of my precious Mom who went home to heaven in 2008. These were the kinds of things that we shared together, so it was like I found a little piece of her in your website. I will really look forward to receiving future posts. BTW, the bedroom looks gorgeous and the apple walnut bread is delish!!! And you have been hiding this beautiful bedroom WHY? I absolutely adore it. It reminds me of a bed and breakfast room. Some place I would love to stay and be perfectly content and cozy in. LOVE IT! Your bedroom looks great. Love the red touches. Making a few changes gives ta room a fresh look. I also have cherry furniture and would never paint it. You have a lovely home. So pretty Ann. I like the little hints of red rather than an overwhelming amount. The new pillows and plates are just the right amount. I bet you enjoy this room a whole lot more now that you have spruced it up. Ann…I’ve heard that the master bedroom is the last room in the house that we decorate, and I think that’s true. We don’t “have company” in our room so what’s private stays private! Once my room was no longer a haven for my kids to jump on the bed and play with their cars on my dresser, I was finally able to fiddle with and tweak my bedroom and now it’s my big girl cave! 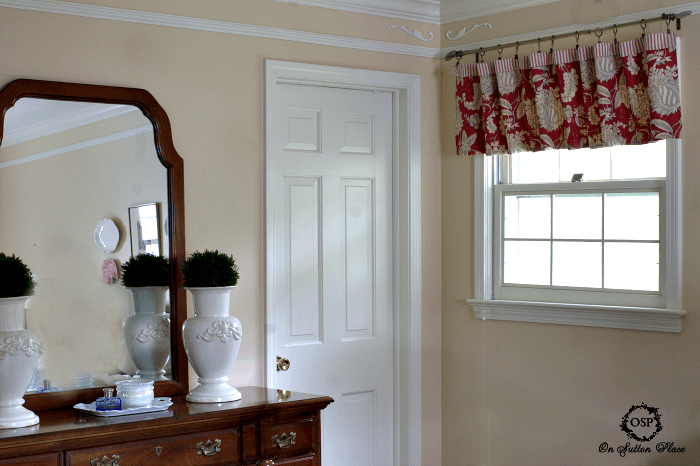 I think you made some nice touches, the red in the comforter, valances and plates really warm the room and look perfect with the cherry furniture (we have that, too). I love the way you arrange your pillows, it makes the bed look so inviting. You really did a great job shopping the house and working so quickly! Love it! Thank you so much Jane…coming from you that means so much. You know what though? I’d give anything to go back and have my kids jumping on the bed. I’m not a very good empty nester! Ann you did a marvelous job decorating your master bedroom. It looks so pulled together. I really like it all but my favorites are the transfer plates and both pillows. You have such a wonderful sewing talent. Love your master bedroom! Is your furniture American Drew? My husband and I bought our AD furniture shortly after we were married also and I am still using it. Hi Ann! Your bedroom looks so lovely! 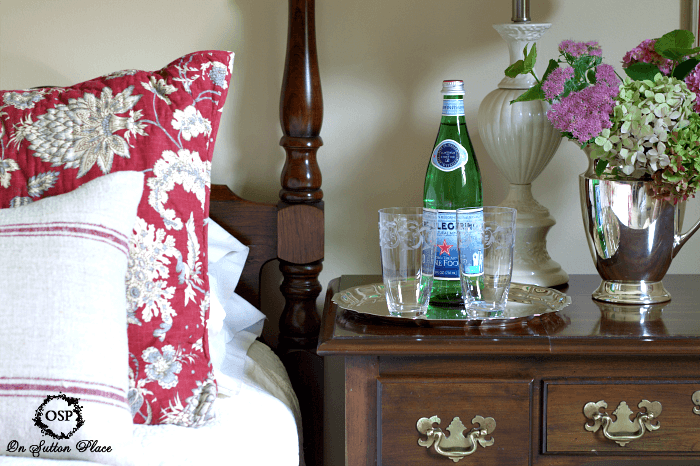 Love the bedding and the red! The little cabinet by the bed looks so pretty and I love how you dressed it. You do it right every time. Very nice Ann. Just like the rest of your home. Comfortable and relaxing. Not over done like many homes are! Oh my gosh Ann! I love how you’ve used touches of red in your bedroom, and you say you only worked a few hours in this room? It would take me days to do what you accomplished in so little time. The transferware plates look fabulous. I’m looking for brown transferware to put in our guest bedroom (which is taking me a loooong time to redo!) See what I mean? Your master bedroom looks beautiful! 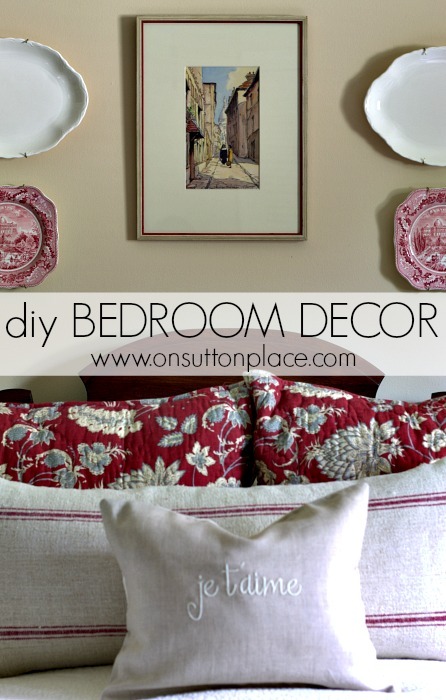 Well, I love the red and cream theme of your bedroom to pieces! Those grain sack pillows are beautiful. Your bedroom looks beautiful, Ann. I hope you hear back in reference to the inquiry. Ann, your master bedroom is beautiful! I love that grain sack pillow! You did a wonderful job! Beautiful! I also have used red in my bedroom with traditional . Love, love it! I also have those prints on the side walls! Great job! So amazing what you were able to do with found items in your house and some vision. What an inspiration! Thanks so much for this. My poor master bedroom has been neglected for the ten years since we built our house. You’ve given me the nudge I’ve needed! Good luck Jennifer! Just a few little changes can really make a difference. I used to have piles of clothes and other stuff on my dresser. Now that I put the urns there I am keeping it much neater! A little incentive is all you need. Thanks for your comment! Beautiful! So crisp, clean, fresh and elegant!! Looks terrific! I did the same thing for my bed: coverlet from JCP (matelasse? sp.?) and then the print at the foot. Great idea. Your work is always lovely! I think your bedroom looks great. I love the crisp red and white palette you chose. I think we all have a room somewhere in our house that has been a little neglected. I’m going to be working on my oldest son’s room very soon. It hasn’t been redone in years. So, so pretty, Ann! Of course, I love the red. :) The pillows are gorgeous…always love your creations! It looks wonderful! I love the touches of red. I recently lightened up my bedroom too. I had some prints with dark green mats in them, and I just spray painted the mats heirloom white. I was surprised at how well it worked. :) Hope you have a fabulous weekend! Lisa, thanks for the idea of spray painting mats. I wouldn’t have thought that would work. Ann, Love the bedroom, especially the touches of red, and the curtain. I never thought dishes were appropriate decorations for a bedroom, but you proved me wrong! I am learning so much from your blog, and enjoying every moment. Hi Lisa! Oh my gosh I never thought of spray painting those mats. I’m a sewer…not a painter so things like that just don’t occur to me. Thank you so much for the idea! Your bedroom is beautiful! I love the pillows! Ann, so pleased to see your master bedroom. Like Sue and Stacey commented, our bedroom too resembles your lay out. We have maple furniture and its hardware looks similar to yours. I wanted a bench at the foot of the bed, but not enough space between it and our wall of closets:( Twenty-five years ago, doors to open to drawers were in style, but now I want to remove them and add baskets or just show the beautiful wood. I’ m hoping before Thanksgiving to complete our bedroom makeover. Love your room in the red and white. It is just perfect. I like when you can shop the house for decor items, why buy new. Your space is just beautiful Ann. 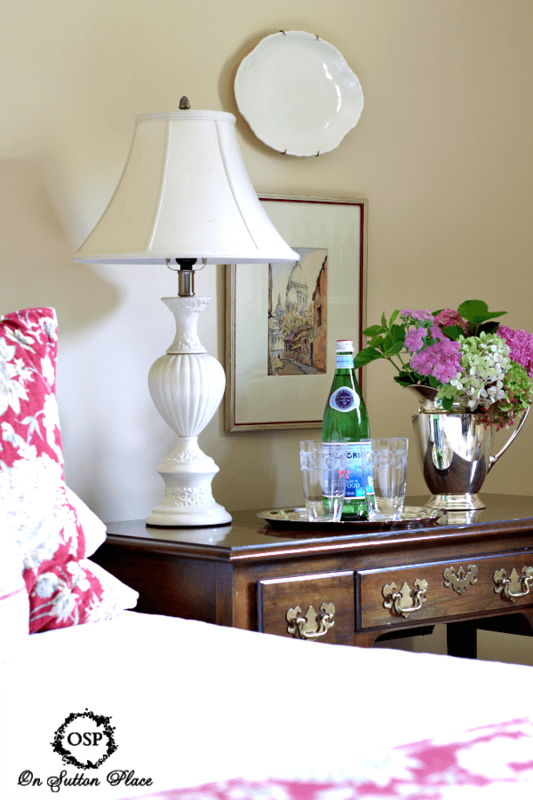 Your room looks lovingly refreshed…sometimes the small changes make the biggest impact! I love being able to come up with a fresh look by using things from around the house. Your bedroom looks so pretty, and your sewing skills come in very handy to add those lovely touches. Oh Ann, you have made my day! Yes, your room looks fresh, and pretty (and yes ,blog worthy), but what made my day is the SIZE of your room. It’s pretty much the same size as ours, lol! Ann, your bedroom is beautiful! Love the use of the red transferware. It works beautifully with the bedding! Great job!! And, as always, your pillows are beautiful! Beautiful Ann!! 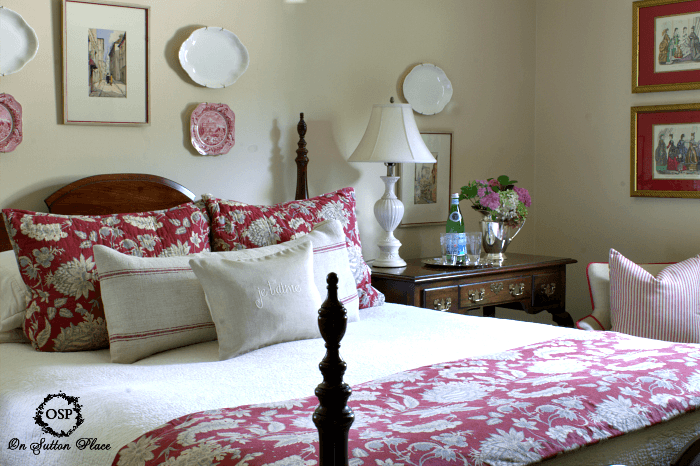 I love your pretty bed and bedding…love the plates on the wall too!